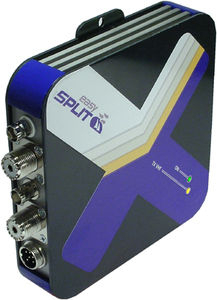 Completely galvanically isolated active 4-way GPS signal splitter that can be used with both active and passive antennas. It is designed for GPS/GALILEO L1, GALILEO E1 and E2 and Russian GLONASS L1 bands. A passive GNSS signal splitter that uses GPS receiver’s power supply to feed the active antenna. It covers the whole GNSS band from 1100 MHz to 1650 MHz. ... two different frequencies, VHF maritime channels 87B (161.975 MHz) and 88B (162.025 MHz). SCOUT has designed the KS-30 antenna to be tuned on the AIS frequencies. Perfectly suited to the AIS radar and AIS Engine. An antenna splitter permits a single antenna to be used for several devices such as VHF, automatic identification system (AIS) and AM/FM radio. This equipment is useful on any vessel with a VHF antenna. The addition of a splitter precludes the need to install a separate antenna for an FM radio or an AIS transponder, for example. This is particularly helpful on boats without sufficient room on mast or rollbar for another mount. It also avoids increasing the number of cables running within the mast of a sailboat. The splitter automatically detects the type of signal being emitted or received and cuts off the unneeded circuitry in less than a millisecond, avoiding interference. When handling AIS emissions (vessel name, MMSI number, destination, course, speed, etc. ), the splitter transforms the VHF antenna into an active, powered antenna. Choice will depend on the type of antenna already present aboard and the devices to be connected to the splitter.